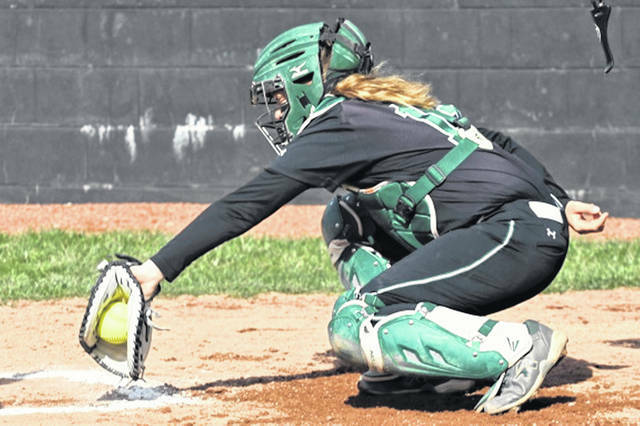 Greenville’s Chloe Sowry works behind the plate for the Lady Wave softball team. SPRINGFIELD – The Lady Wave grabbed a lead late in Saturday’s road game and brought home a 6-1 win over the Division I Springfield Lady Wildcats. The Lady Wildcats plated a run in the bottom of the second inning while keeping the Lady Wave off the board through four innings of play to lead the Greenville girls 1-0 with four innings in the book. The Lady Wave found its stride in the top of the fifth with Courtney Bryson legging out an infield single. Bryson advanced to second by way of a Lady Wildcats error and followed with a steal of third setting up Greenville’s first score of the day with Morgan Gilbert hitting a RBI sacrifice fly and reaching safley on a Springfield error while scoring Bryson to make it a 1-1 game. A Susi Blocher smash to short was misplayed for an error followed by a Lani Shilt infield single putting runners on first and second with two outs. Kennedy Fashner promptly stepped to the plate to drill a three run homer to left and give the Lady Wave a 4-1 lead. Greenville would go on to score single runs in the sixth and seventh innings while keeping the Lady Wildcats in check to earn a Greater Western Ohio Conference win and move to 11-1 on the season and stay perfect in conference play with a 7-0 record. “It’s really going to get exciting on the softball field for the kids and the fans as the weather turns,” Newland said. The Lady Wave surrendered one error on the day while Springfield was committing five errors in the game. “Some great plays and nice efforts out of Kennedy (Fashner) and Chloe (Sowry),” noted Newland. Fashner paced the Lady Wave with a homerun, 3-RBIs and a run. Shilt went 2-4 with a run scored and Natea Davidson was 2-3 with a walk. Gilbert went 1-3 with 2-RBIs, Bryson 1-3 with a run, both Haliegh Mayo-Behnken and Nyesha Wright went 1-3 with a walk and a run. Chloe Sowry finished the day 1-3 with a RBI and Susi Blocher went 1-3 with a walk and a run scored. Fashner pitched a complete game throwing seven innings of one run ball, allowing seven hits and a walk while striking out one. “Now 11-1 on the year and excited for the Tipp series the week,” concluded Newland. https://www.dailyadvocate.com/wp-content/uploads/sites/34/2019/04/web1_Chloe-Sowry.jpgGreenville’s Chloe Sowry works behind the plate for the Lady Wave softball team.